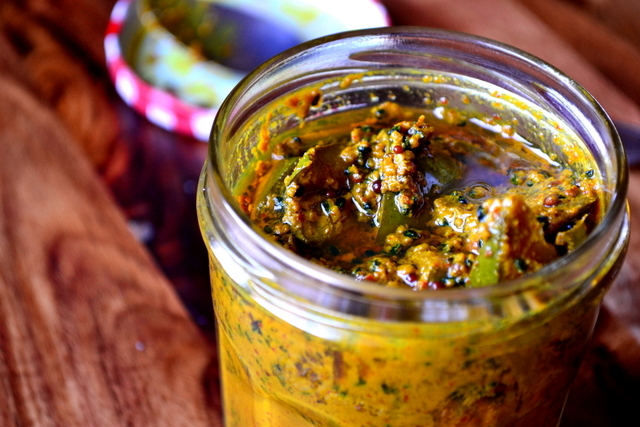 Condiments like mango pickle or chutney play an important role in Indian cuisine, at least in Britain. It is ill-advised to spend time slaving over the stove in pursuit of a delicious curry only to forget one of the aforementioned accompaniments – the only possible outcome is disappointment. Unfortunately, good quality pickle and chutney is often rather expensive and you’re far more likely to end up spending your hard-earned money on a jar of overly sweet mango “jam” than you are an intricate and well-balanced chutney. The situation is similarly dire in the case of pickle, which can be hard to find at the best of times. Instead, it is better to find a recipe – such as the one below – and produce your own condiments. It takes a little time, patience and commitment, but the exercise is worth it in every respect. I am of the opinion that the key to a fantastic pickle or chutney is the use of whole spices. 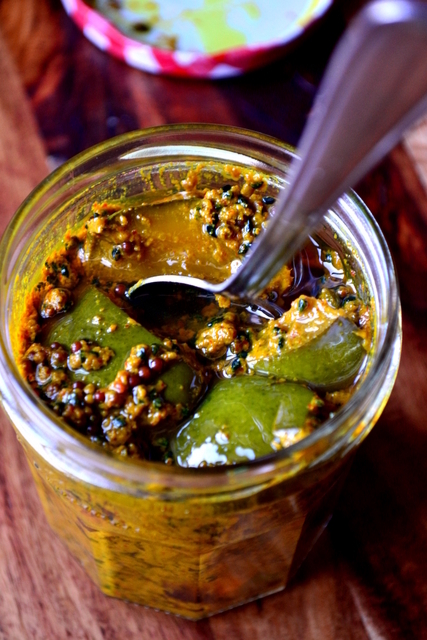 Of course, ground turmeric and fennel provide a wonderful base of flavour, but whole mustard and kalonji seeds provide much needed bursts of intense flavour that really serve to elevate a pickle or chutney above its competitors. Remember, these small additions to a meal aren’t intended to be slathered across every mouthful, they should be powerful and pungent – special not constant. 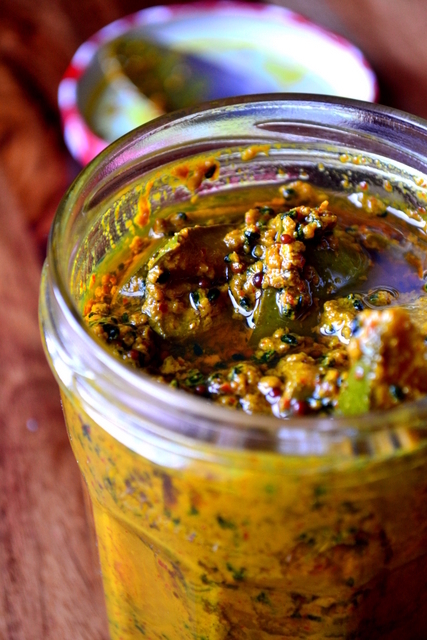 Above all, time is the most important ingredient in a mango pickle. The mango needs time to dry and the spices time to mature, develop and mellow. Rush this recipe and you’ll simply be left with a soggy pile of putrid fruit, not fit to grace the most mass produced of jarred curries. However, get it right and that curry night you have once a week will never be the same again. Or at least until you realise you’ve devoured the first three jars of pickle and more is needed. *mustard oil is best used if you want a very pungent pickle. Wash and roughly chop your mangoes, keep the skin on unless it is particularly thick and tough. Coarsely grind the fennel seeds and chilli flakes. Place the mango in a large bowl and cover with the spices and salt – mix thoroughly. Cover the bowl with a thin muslin and leave the mangoes in the sun for 3-6 days – until dry. If finding enough sunlight proves tricky, try spreading the pickle on a baking sheet in a slightly warmed oven overnight. Once dry, transfer the mangoes and spices to three sterilised jars. Pour in the mustard or vegetable oil until it just covers the mangoes. Seal the jars and shake. Shake the sealed pickle every day until ready (3-4 days). Enjoy with a curry, or simply with chapati or paratha. Cost: The price of mangoes is hugely divergent depending on where you are and the time of year. At the moment my grocer is selling them at 3 for £1, which is almost unbelieveable. As such, this batch of pickle set me back a mere £2 and will last for months. However, it may be a little more expensive, depending on the price of mangoes where you are. Looks wonderful and you’re so right about the over-sweetness of most bought pickles and chutneys. Interesting… I’ve only ever heard of drying the fruit :D. I love chutney. It’s lime pickle next though. Perfect to accompany a curry. Good. Thank you, Rosemary. Again, so happy for you. Sounds delish! Just to make sure, will this will last a couple months in the refrigerator without actually canning them? Thanks. Yes, definitely! Probably longer. It’s the oil and salt that preserves the fruit more than anything. Finally! I will be able to make this! Thanks for the recipe. My pleasure – glad you like it. Oh my – well, you have to make it… mango tree?! Jealous! This looks fabulous, can’t wait to try my hand at this! Please do – it’s a really great pickle. Thank you – yes very simple and inexpensive. Indian food is definitely something to practice. Once you get the basics nailed down it becomes really very easy. Looks delicious, will be trying this very soon! I do love a good Indian pickle, they are so addictive! This one is quite beautiful with the bright turmeric colour and the speckles of the seeds. They are indeed – thank you, Eva! Should the mangoes be green or ripe? The mangoes I used were firm, but not green. Somewhere in between, if you see what I mean. love mango pickle.i always buy when i go to Belgium.we can`t find it here in Albania unfortunately. yes mango we have,but i don`t know how is this done. Mouth watering! 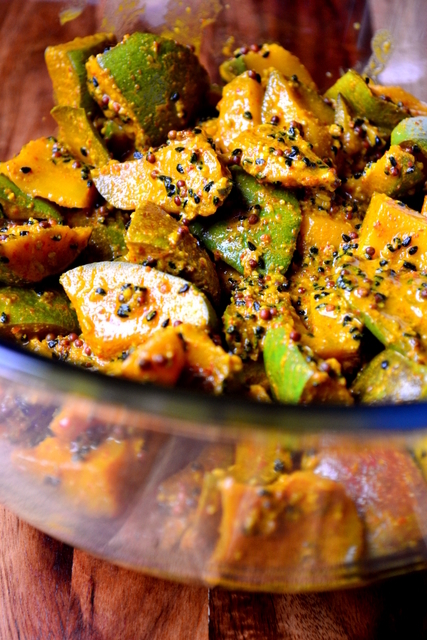 The achaar is what makes a simple meal robust! 😀 love the pictures! This looks so delicious! I absolutely adore mangoes but have never tried a mango pickle before. What sort of dishes are they commonly served with? You mention curry but is that the main use? Thank you for sharing!